I admit that a year ago I hadn’t even heard of the phrase “Bucket List” and even had to ask what it meant. Of course once it was patiently explained to me that it meant “Things to Do Before you Kick the Bucket”, it was blindingly obvious, but the phrase had previously passed me by. One good friend has a Bucket List. She’s doing quite well at ticking things off it, but also seems to add things at a frightening rate, so I’m not sure how that will work. 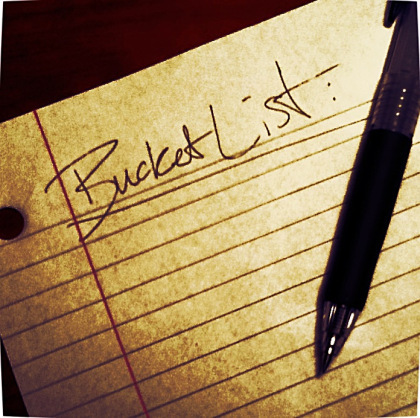 So for a few months the only thing on my Bucket List was ….. umm ….. to make a Bucket List. Trouble was, I quite genuinely couldn’t think of anything to put on it. This got me to thinking about the nature of contentment, happiness, completeness, and all that kind of thing. Obviously the big thing on my Bucket List for a while has been to have my own little corner of paradise in Spain, and since achieving that last summer I have been resoundingly, overwhelmingly, radiantly, and rather annoyingly, happy. Happiness tinged, of course, with the loss of my mother after I had begun the purchase, and the sadness that she would never see my Axarquía home. And that’s a massive item to have ticked off. I’ve been saving up for almost ten years to make it possible (which means it’s mildly annoying when people say “Oh aren’t you lucky!” as though I woke up one morning with the deeds to a house unexpectedly on the doormat). I wonder if the number of items on people’s Bucket Lists says something about their level of contentment? Or, perhaps harshly, about their capacity for contentment? It seems to me there’s a fairly obvious correlation between a list of things unachieved, and a niggling feeling of discontent. And reading one of the ex-pat forums on the internet, there is quite a number of people who HAVE achieved what might be on many other people’s Bucket Lists, ie to live in Spain (or the foreign country of their choice), yet remain very discontent with it. They appear to have very long Bucket Lists, consisting of (1) change Spanish bureaucracy to be more like the UK; (2) change the Spanish language to be more like the UK; (3) change Spanish laws to be identical to the UK; (4) change everything about Spain to be more like the UK, except the weather. Then this weekend I listened to a young woman called Helen Fawkes on Radio 4. She is a journalist, now writing a blog called “living with cancer” at http://helenfawkes.wordpress.com . She doesn’t call hers a Bucket List – she calls it a List for Living. I like that. It’s about shaping our lives to how we want to live them, hopefully for quite a long time, rather than about ticking things off so we can head happily towards our graves! So I’d like to hear what’s on other people’s Lists for Living. This will hardly be scientific, but it would be interesting to see whether people who have made the move to their chosen “paradise” have fewer items on their Lists for Living. This entry was posted in Spain and tagged Andalucia, Axarquía, bucket list, Spain, SpanishBlog, Tamara Essex by tamaraessex. Bookmark the permalink. One thing for me is to become the best painter I can possibly be. My list for living is short. I am happy with my little life. Thank you for that it has got me thinking. Zara your art already gives so much pleasure. I don’t really know what might constitute a “large” or a “little” life, but I see both breadth and depth in yours and it is inspirational. I don’t see it in any way as a measure of my contentment or otherwise with my life. I live a very happy life and consider myself very fortunate indeed – though I totally agree with you, Tamara, when people remark that I am “very lucky” to be living in Spain. There’s no luck about it – it was carefully planned and worked hard for. I look at my Bucket List as a way of remembering things I would like to do – which might be as simple as milking a cow (yes, still on my Bucket List), teaching English as a volunteer in a foreign country (did this in Cambodia last year) or swimming with dolphins (which is also something that I have done, and was amazing). Just because I am content with my life in Spain doesn’t mean that I have stopped wanting to do other things too. I love travelling – as you know I’m in New Zealand at the moment – but equally it’s always nice to get back home. You’re such a great example of someone with a really full life Marianne. You really make the most of travelling and immersing yourself in a locality. And I take your point about bucket lists and contentment ….. I think I was being slightly provocative deliberately, there! Great post Tamara. 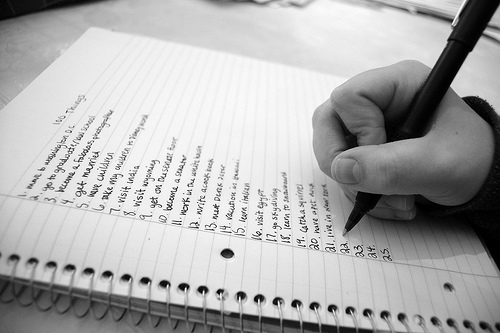 I´ve read ,many bucket lists, had the thoughts I ought to do one. But why? It´s not prevarication (amazingly enough) but would it end? There are so many things I´d like to do, so many places I´d like to visit that I think the sheer magnitude of the list would be depressing. Taking and making opportunities daily is my ´contentment´ the next plan enough for now. I guess if I knew when the bucket was coming for me my thoughts might change and I don´t think that would be rushing about having adventures but more about the people I love. Provocatively thought provoking post Tamara! I’ve not made a bucket list in terms of activities, but I have a kind of foodie bucket list going on of things I want to try. I don’t think I’m the only one that does that though! Alice Pyne wanted everybody to have a Bucket List and won a Pride of Britain Award for her fantastic charitable works in her short life – and was a founder of the Charity, Alice’s Escapes. I like “List of Living” too! It is funny when you move abroad that people think it just fell into your lap somehow! I think people back home must imagine I’m on a permanent holiday. I’ve only just seen this post Tamara! I don’t know how I missed it. I shall change it to life-list forthwith. My bucket list isn’t about doing anything before I die, it’s just about doing it! I also don’t like the term ‘lucky’. I prefer fortunate and my answer is an adaptation of a quote “yeah, the harder I work, the luckier I get”. Sometimes it completely goes over people’s heads and that balances out the annoyance by amusing me!